Tomonobu Itagaki is leaving Tecmo and suing the company for unpaid bonuses. The Dead or Alive creator cites an unfulfilled Dead or Alive 4 completion bonus, stating, "President Yoshimi Yasuda chose not only to violate this agreement, but also turned defiant, telling me 'if you are dissatisfied with the decision not to pay the bonuses, either quit the company or sue it.'" 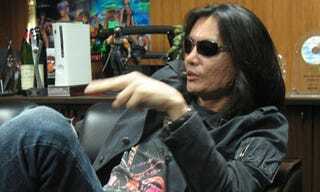 Tomonobu Itagaki's translator Andrew Szymanski contacted Kotaku, telling us, "At approximately 2:30 PM Japan Standard Time today, June 3rd 2008, an official statement from Tomonobu Itagaki was sent by fax to major Japanese news outlets. In the interest of fair and expedient reporting of this story throughout the English-speaking world, I have been asked by Itagaki to convey this statement to you. Herein find attached Itagaki's official statement, in English, for the benefit of your readers." What does this mean for Itagaki's future? Szymanski does not know, adding, "You will likely have questions regarding the content of the statement, or about Itagaki's future plans. I am afraid that I will be unable to answer such questions for the time being; however, rest assured that more information will be forthcoming as soon as it is deemed appropriate to do so." Quitting Tecmo (and suing it) means the chances of Itagaki making Dead or Alive 5 are more dead than alive. Guess he wasn't kidding when he said Ninja Gaiden II would be his Ninja Gaiden swan song. Hit the jump for Itagaki's full statement. I, Tomonobu Itagaki, hereby announce that on the 14th of May 2008 I filed a complaint in the Tokyo District Court against Tecmo Co., Ltd. for unpaid completion bonuses, and against the President of Tecmo, Yoshimi Yasuda, for such unlawful acts as unreasonable and disingenuous statements made towards me, claiming damages in total of 148 million yen. I also announce that this complaint was delivered to the defendants on May 22nd of the same year. In addition, I hereby announce that I have today submitted a letter of resignation to Tecmo Co., Ltd. stating that I will resign as of the 1st of July, 2008. The conduct of Tecmo Co., Ltd. and its president Yoshimi Yasuda towards me has been unbefitting of a publicly-listed company. I have filed this lawsuit with a strong intent to question the social responsibility of Tecmo Co., Ltd. and its President Yoshimi Yasuda, as well as condemning them for their unjust acts. Today, in addition to announcing the reasons for this lawsuit, I make clear my reasons for resigning. I truly feel sorry to all the fans of the games I have made. NINJA GAIDEN 2, which will launch on the 3rd of June will be the last NINJA GAIDEN I will create. I will also never be able to make DEAD OR ALIVE 5. I regret the circumstances that have forced me to leave Tecmo, where I had worked for so many years, and I regret the disappointment this will cause my fans. However, I can no longer continue to work with President Yoshimi Yasuda, a man who chooses not to honor promises even when he is able to do so. I truly hope that nothing like this happens again in the future.